This product is awesome. My husband shaves every morning and had been using Eucerin lotion on his head but it made it very oily. He now uses this spray and it keeps his bald head moisturized and non oily. He loves it. My daughter sprays it on her hands several times a day and it has worked wonders for her severe eczema. Her hands were so bad that she couldn't bend her fingers. This has worked wonders in combination with the honey eczema cream and wet wraps. I recommend leaving this product in the refrigerator for a cooling effect on your skin after or in between applications of the Eczema Honey. It is not as effective on eczema as the Honey is; however, it’s a great addition to the honey routine. I spray it whenever my skin itches and notice instant relief. I found this product soothing to my tortured skin. As I'm older and have some joint issues for some reason I found this sprayer difficult for me but like the product very much. Marisol A. Reviewed by Marisol A. This stuff has saved my skin and I am so thankful. I suffered from winter time psoriasis that left me itching all day and night. I’ve been using this stuff for a year and it has changed my life with no exaggeration it even helped me kick a weird case or dermatitis around my eyes that was so painful. I was so tired of not getting answers or solutions from dermatologists that only prescribe lotions and chemical serums with words I can’t even begin to pronounce. 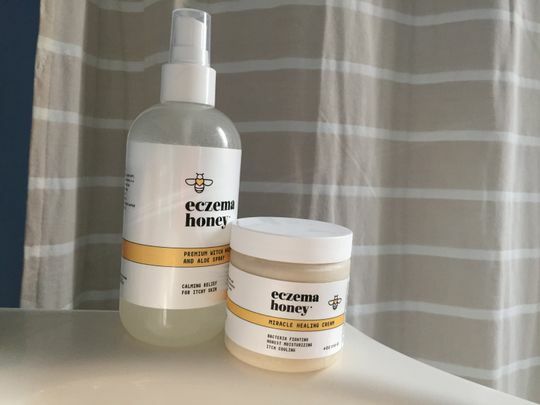 @eczemahoneyco you changed my life and gave me my skin back and I’m forever grateful for this product.